The holiday season is upon us. Your students are probably buzzing with emotions and you may be, too. Whether its excitement, joy, apprehension, anxiety, or even indifference; the holidays bring an array of emotions. How can we turn this energy into a more positive and productive emotion in the classroom? We tend to hear the word “gratitude” a lot during the holidays. We may even hear the word so much that it begins losing its value. So what is gratitude, really? If you were to really reflect on gratitude right now, you most likely wouldn’t give this positive emotion much thought. But did you know that gratitude is one of the biggest keys to living a healthy and happy life? Gratitude is simply good for the universe. It promotes positivity and kindness, and improves overall health. Gratitude helps us to appreciate the present, and it helps us to recognize good in the world. Studies show that positive emotions have positive health outcomes. Positive emotions have a huge impact on our physical & mental health. People who are happier tend to be healthier. Gratitude helps us to build core traits, like resiliency. When we focus on the positives, the negatives don’t seem as bad. Gratitude can lead to positive actions. Gratitude encourages kindness. When we show our appreciation for the things people do for us, this can encourage us to do kind things in return. Gratitude helps us connect with people around us. Gratitude can be a social emotion. Cultivating feelings of gratitude helps us to be more generous and compassionate. These positive feelings help us to build authentic connections with others, and it strengthens our bonds with our loved ones. How We Can Foster Gratitude in the Classroom? Introduce gratitude journals. Gratitude journals help us keep track of everything good, no matter how big or small. Keeping track of all the things we’re grateful for can reduce our stress levels and give us a positive outlook on life. Cultivating the habit of writing in a journal may seem difficult, but it is well worth it. Have your students spend 5-10 minutes each day reflecting on things they’re grateful for. Challenge your students to aim for finding 5 things each day. It's important to remember that things we’re grateful for will look differently for everyone. Encourage thank you’s in the classroom. Encourage your students to give thanks whenever someone offers an act of kindness. Fostering this habit in youth will help them as they transition into adulthood. Remember, gratitude is a social emotion, and this will encourage students to be more compassionate and kind towards others. Don’t just encourage them to just say thank you, encourage them to reflect on what they’re thankful for. When they say thank you, they should be specific about why they are thankful. For younger students, try using these sentence frames: Thank you for ________. I appreciate this because ________. Encourage generosity. Generosity can be defined as the “quality of being kind and understanding, the willingness to give others things that have value.” By encouraging generosity, we are teaching our students to be grateful and to do kind things in return. Being generous comes in many different forms and doesn’t need to require money. Whether it’s lending another student a crayon, or writing a get-well card for a sick friend; these are forms of generosity that you can introduce to your students. Have your students brainstorm things they could offer others. Try providing examples, such as: I can help my friend study for their test, I can help my brother clean his room, or I can pick up my sister from school. Lead by example. The best way to foster gratitude in the classroom is by leading through example. Reflect on what you’re grateful for in your own life and set a clear definition for this term in the classroom. Foster this grateful attitude in your students by encouraging a positive and thankful atmosphere. One way you can begin to do this is by implementing an activity that encourages gratitude. We recommend that you download our “Thankful Thoughts” classroom activity to try with your students. Introduce literature focused on gratitude. Studies show that giving students access to literature is a major key to their success. So why not leverage literature to help cultivate that thankful spirit in your classroom? The books below are dedicated to teaching younger students about gratitude and the benefits it brings to our lives. This colorful picture book will inspire children and adults alike. The beautiful illustrations and heart-warming examples of kindness teach children about the power of gratitude, generosity and caring for one another. Also included are activities for children to practice skills for creating gratitude and compassion. You can listen to Good People Everywhere here. Thankful tells the touching story of people who express gratitude for everyday blessings. This wonderful poem combined with stunning illustration inspires children to be grateful for the blessings in their lives. 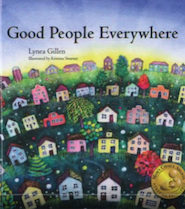 Meant to be read aloud, this gentle story will remind children and adults of how fortunate they truly are. You can listen to Thankful here. 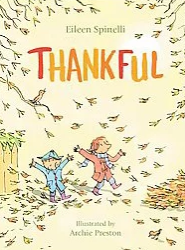 You can find other gratitude-themed children’s books here.